Motivating students to study difficult lessons can be a daunting task. Stimulate the minds of your class by breaking down chunks of information into bite-sized educational posters. 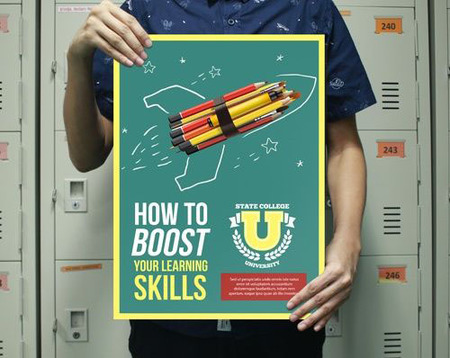 With school poster printing, you can make learning fun and improve your students’ comprehension of your subjects. Hosting science fairs, proms, open-houses, or back-to-school parties? Organizing events can take a lot of effort, especially for school-related ones. Promote your campus events and gather audience from your community with school posters. Print school posters in vivid colors and enhance them with our premium coating options. Our educational posters are available in 12 poster sizes with optional folding for creative presentation. The most popular size to print our school posters is 11” x 17”, the ideal size for informative classroom posters and event posters. Need your school posters now? Get your educational posters fast with our same-day turnaround option. For additional custom options, call our friendly print experts or fill out our custom order form. Make sure your school posters fit the printing requirements by downloading these layout templates. Included in our affordable direct mail services: processing of 1 mailing list, duplication removal if requested, CASS Certification, inkjet addressing, and postal presorting for automation rates. The cost to process posters for mailing is $24 for an order of 1,000 posters with an $85 setup fee, plus postage (minimum 250 pieces). For mailing posters at automated rates, tabbing is required. Add tabbing during the ordering process or offline. Creating educational posters for classrooms and event posters for school events will boost your students’ confidence and your school’s community reach. To make an effective poster, you need to know how to summarize information visually and the best place to put them up. A good poster should be readable even from 5 to 10 feet away. The title should sufficiently represent the content as well as draw your reader’s interest. For educational posters, try to summarize text into bullet points. Use graphs and images to illustrate important points and make it easy for readers to remember. For event posters, entice potential attendees with creative visuals. Don’t forget to include event details, especially the venue and the time for the event. The best place to put school posters are bulletin boards. However, you can also put them up on your bare walls, on your blackboards, and doors where they will be seen. Contact our friendly print experts to print school posters today.